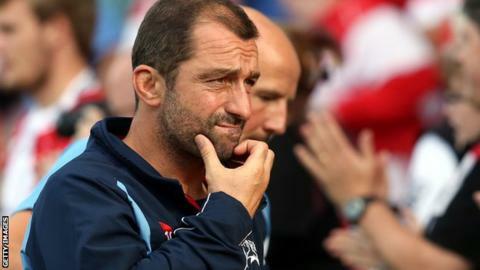 Sale Sharks head coach Bryan Redpath says he wants to return to a director of rugby role in the future. The 43-year-old became Sale boss in the summer of 2012 following a three-year spell in charge of Gloucester. But after their worst start to a Premiership season, the former Scotland international scrum-half was demoted to a coaching role. Asked if returning to a director of rugby was a possibility, Redpath said: "Yeah, of course." He told BBC Radio Manchester's Rugby Union Extra: "I had three years at Gloucester prior to coming back and I loved every minute of it. "I made the choice to come back to Sale as director of rugby and at that time it didn't work out. "I maybe could have moved on. I decided to stay and try and fight for the group and make sure it was the right thing for everyone. "I didn't want to be seen as someone who walked away from a challenge and I work well with Steve Diamond." 5 Nov - Mitchell states his future is with Golden Lions in South Africa, casting doubt on a move to Sale 20 Feb - Steve Diamond confirms he will remain as director of rugby at Sale for "the next couple of years"
Following Redpath being moved aside, Sale appointed former New Zealand head coach John Mitchell to take charge of first-team affairs, but he left after only a month for personal reasons. Since then, Steve Diamond has been director of rugby, with Redpath taking a leading role in Sale's attacking play and backs coaching. "It's been good for me," he said. "I've learnt a lot in the last three seasons and some of them times were tough and not so good. "I was fortunate to be successful as a player and I want to get back to being successful as a coach - life doesn't just stop because you've had one kick in the teeth. "I'll get back on track and I'll succeed somewhere. If it's here [Sale] great, if it's not and when my contract expires if I have to move on, I move on and that's just the nature of sport. "I proved it as a player and I'll do whatever challenge I take up next - whether it's coaching or another business venture or whatever I want to be successful."